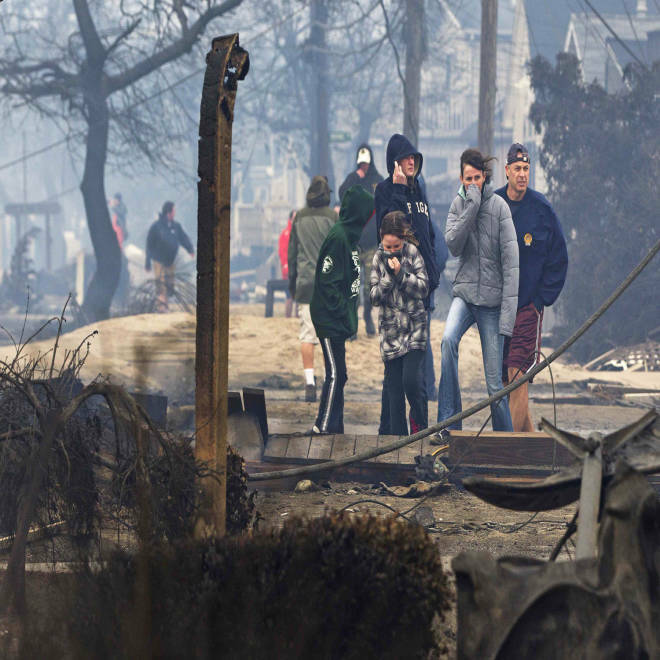 New York City's mayor, Michael Bloomberg, gives a brief update on a horrific fire, in the Breezy Point section of New York City's, that charred "more than 80 homes." 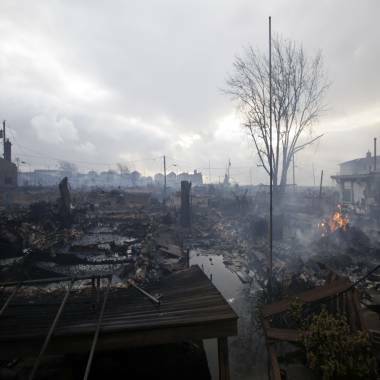 Damage is seen Tuesday after a fire in Breezy Point, Queens. 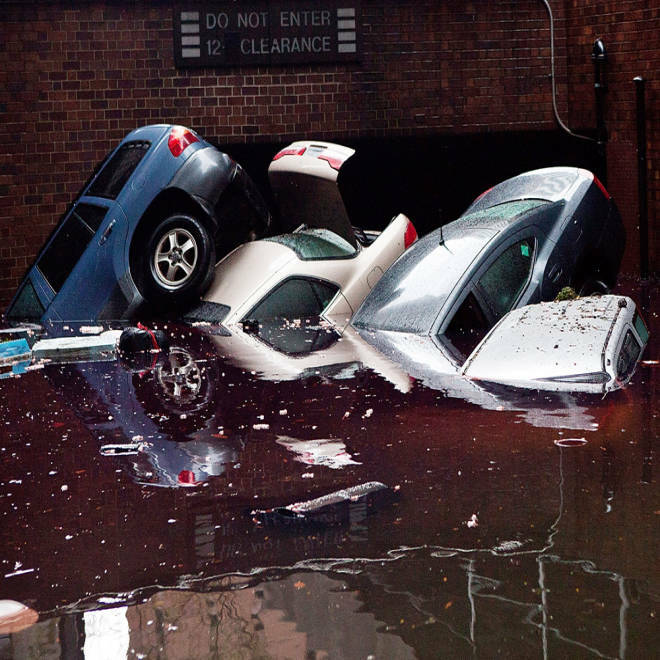 The fire erupted at the peak of the storm in a Zone A area, which the New York City Office of Emergency Management declared to be the highest risk of flooding from Superstorm Sandy’s surge. FDNY spokesperson Michael Parrella told NBC News that nearly 200 firefighters were on the scene by 5 a.m. Tuesday, battling high winds that made the flames difficult to knock down. “The winds were just devastating, blowing from one building to the next one,” Bloomberg said. With floodwater from the storm filling the street, firefighters had to use a boat to make rescues, the Associated Press reported. Fire department officials said about 25 people were trapped in the upstairs unit of one apartment, and the two-story home next door was ablaze and setting fire to the apartment’s roof. Firefighters climbed an awning to rescue the trapped people and took them downstairs to a boat in the street. Residents stand among homes in Breezy Point, Queens, Tuesday devastated by a fire and the effects of Hurricane Sandy. New York State Assembly member Phillip Goldfeder, who represents the district that includes Breezy Point, said the small coastal area, which contains about 3,500 homes, sustained “immeasurable damage” from the storm. “No one could respond for a while, and when they did, they did not have anywhere near close to the resources they needed,” Goldfeder said, adding that three area volunteer fire departments were working alongside the FDNY through the night to contain the blaze. One firefighter sustained minor injuries and was transported to an area hospital, Parrella said. 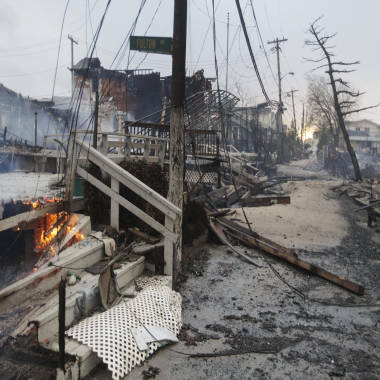 A fire that ravaged through the flooded Breezy Point neighborhood in the New York City borough of Queens destroyed at least 80 homes. Emergency crews began canvassing the area at dawn Tuesday to make sure no one was trapped in any of the gutted homes, NBCNewYork.com reported. Goldfeder said residents of the impacted areas were still trying to make their way out of the wreckage by Tuesday afternoon. The cause of the fire was not immediately known, Parrella said. The Breezy Point neighborhood, which sits on the western edge of the Rockaway peninsula, jutting into the Atlantic Ocean, was historically a summer get-away for many residents of New York. Now, Goldfeder said, about 80 percent of its residents live there year-round. Reports of the fire came just hours before President Barack Obama signed a major disaster declaration for New York and Long Island in the wake of Hurricane Sandy’s destruction, enabling federal aid to assist with storm recovery efforts. About 170 firefighters were called to the scene in Breezy Point, Queens, where at least 50 homes have caught fire. MSNBC's Chris Jansing reports.